I had planned to keep the answers for my own selfish perusal. But several folks asked to know what others said, and as a mere weathervane spinning in the winds of popular opinion, I am powerless to resist. So here you go. As it turns out, there is a simple answer: xkcd. In all, xkcd got 150 votes (if you include things like “xkcd?” and “xkcd maybe? but also not really”), ten times more than the runner up. That makes sense. 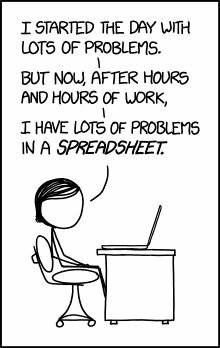 This blog doesn’t much resemble xkcd, but certainly rides in its stick-figures-and-math-jokes-and-occasional-sentimentality wake. Here is the complete list of other recommended sites, loosely organized by category, and weeding out the inexplicable ones (the BBC?). Anything that received multiple votes is bolded. If you’ve got other suggestions, feel free to leave them in the comments below! Please suggest only others’ sites, not your own – I think a list of endorsements will be more useful for people than a list of classifieds. I like the cover on this site better than the one on Amazon. NOTE: I’m an artist… but the mother of a mathematician. Yeah, we’re going with the blue one – I’m glad your artistic preference points the same way!